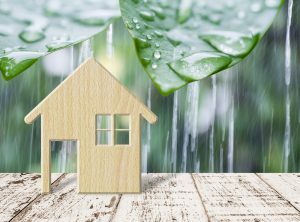 Home / UncategorizedHOW TO RAIN PROOF YOUR HOUSE THIS MONSOON!! Monsoon is here again by bringing joy to hearts, smiles on faces, and yet with monsoon comes leakages in roof, dampness on walls, dirt and dullness. For a home, this could also mean damp walls, leakages, a lessening of light and warmth. However, with a few quick tips and tricks, there is no reason why the magic of the monsoons cannot be welcomed into your home. Making your home rain ready or giving it a monsoon makeover does need a little thought and attention to detail. Go clean: The simplest things are the ones that people overlook! Ensure you have door mats at the right places to keep all those muddy footprints out of sight. Roll away your carpets and bring down those heavy curtains. Keep them safely covered in plastic bags after sun-drying them for the next season. Let your rooms breathe: Open up those windows when the rains take a break! Lack of ventilation can cause dampness and lead to health problems. Changing the painting of your living room and adding small décor accessories is one of the easiest ways to change the way your home looks during the rainy season. Let there be light: Mood lighting can make all the difference when the weather is dark and gloomy. Make sure that the house is well-lit. Switch from white to yellow lighting to create a warmer look inside. Add the aroma of aromatic candles to relax your mood. Don’t forget to keep an eye on leakages and fix them well in advance as they can spoil your décor, big time! Check leakages of your house: Along with the décor in monsoons, the safety factors too need to be tended to. Check all electrical wiring and appliances to avoid any kind of accident. If you have a terrace or roof, check thoroughly for any kind of water seepage or leakage. When you begin to give home makeovers for the monsoons, keep this on your priority list as it is best done before the rains come. Termites are a major problem wherever water leakage or high humidity levels are a feature. They would require professionals to do a really complete job, but you would need to check the whole house for any signs of termite infestation, which tend to increase during the rainy season. Waterproofing of the roof is essential before the onset of monsoon. Check that the drains are not blocked with leaves. Ensure that water is directed away from the foundation. Check the underside of roofs for leakage or water condensation. ← MODERN CENTER TABLES FOR A LUXURY LIVING ROOM !! INTERIOR DESIGN TRENDS FOR 2019 ! !